These were my first attempt a a new stuffed chocolate chip cookie recipe, pre-dating my Peanut Butter Cup Stuffed Chocolate Chip Cookie Recipe which I posted first on this site. 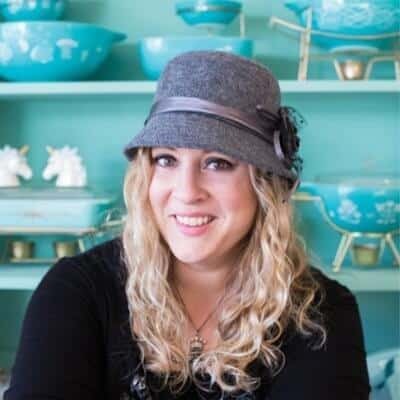 Recipes don’t always go in order and recipes are almost NEVER as I make them. Most people don’t realize the processing time that goes into making pictures look good, double checking that a recipe really works and then posting it. I am crazy picky about what goes on here, nothing is worse than trying out a recipe that just won’t work. I work hard for you peeps, I really do. The taste testing alone just about kills me. Well, definitely my hip measurements, that’s for sure. These cookies were actually baked at the beginning of June! But that’s how the process works. I used this dough minus the chips, to test out my theory, had fun with it and then moved on. 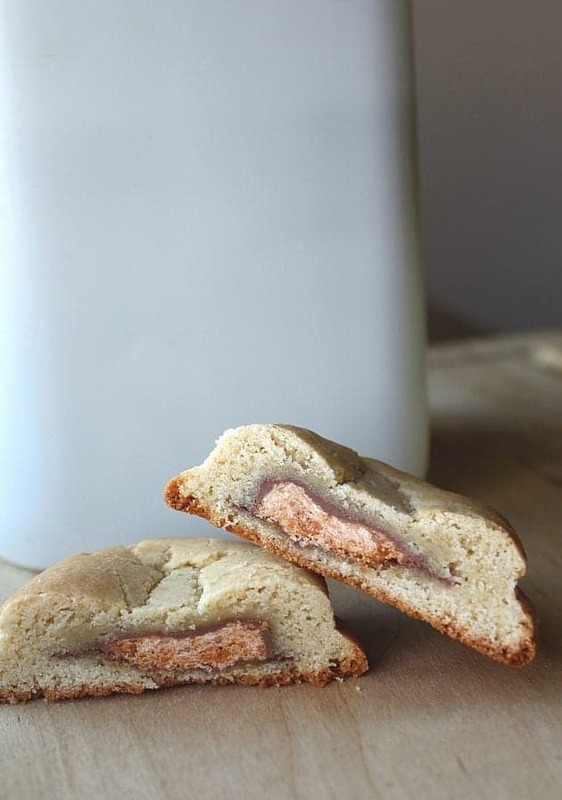 And forgot to edit these pictures in my excitement over the peanut butter cup stuffed cookie recipe. Yup. That’s totally how I roll! These happened when it rained for a week straight. I go a little crazy and start thinking weird, out of control thoughts. Those thoughts almost always include chocolate, mind you, so really, how crazy can that be? These were born out of sheer boredom. I was tired of looking out my windows at the rain pouring down on the flowers I couldn’t garden and I needed to numb the pain of being locked inside a house with my children and no reprieve in sight. I took my thick and chewy chocolate chip cookie recipe and wrapped it around various small chocolate bars, which by the way, are now available in stores year round in little packages. Now, as I am sure you noticed in my pictures, I didn’t put in the chocolate chips this go around, mainly because when I test out recipes I am well aware that it may be going straight into the garbage! 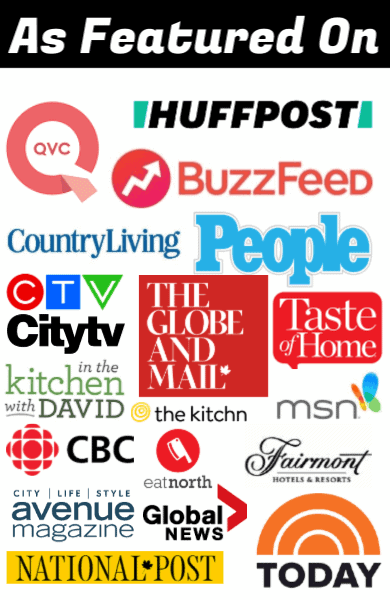 Many recipes don’t make the cut and either end up eaten with a shoulder shrug and a “meh” used to describe it (like some pork chops a week ago) or “oh my Lord what went wrong? ?” and straight into the garbage it goes. I should have known it would turn out fantastic. I deliberately chose my thickest cookie dough so it wouldn’t melt all over, exposing the bars within and it worked like a charm. 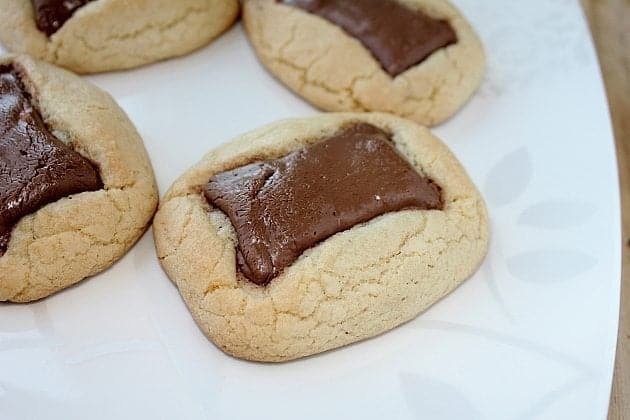 I have yet to find another recipe like mine where the chocolate bar isn’t just melted within the cookie, that’s not really “stuffed”, that’s just a cookie dough with chocolate bars in it. I’m sure one is out there but I had to wing this on my own. Not that there is anything wrong with chocolate bars melted into cookies, I mean they are chocolate bars melted into cookies. Hello yum and these are next on my list. But these beauties end up with you having a whole mini chocolate bar in the middle! 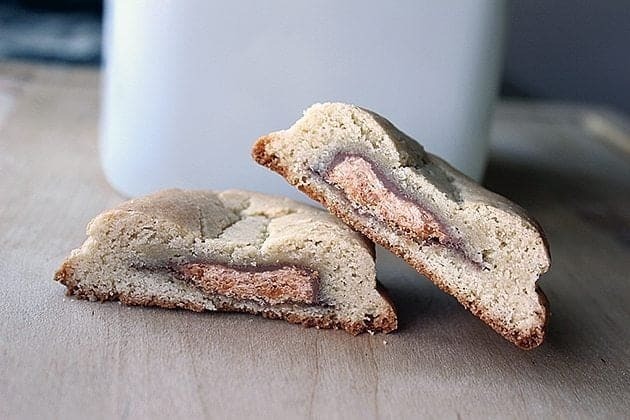 Choose harder chocolate bars instead of gooey ones and you will have amazing cookies that surprise you with that first bite! The lack of butter in the recipe is what helps keep the dough around the bars instead of a gooey mess and hold them right in. When that is done, fold in the two cups of chocolate chips by hand, and prepare to wrap chocolate bars! The mini KitKat cookies turned out lovely, little long bars, mine is the top and my daughters creation the bottom. They both baked up perfectly. 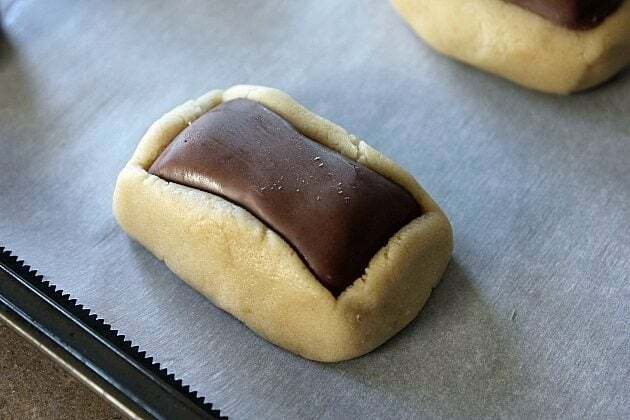 Take the dough and wrap it around the KitKat like below. Then push it down and fold up the edges like this. It bakes up into this amazing Butterfinger Brick cookie, which is what we call now them in this house. Lordy, these are even BETTER with chocolate chips in that dough! Butterfinger lovers, meet the Butterfinger Stuffed Chocolate Chip cookie. A whole mini Butterfinger in a cookie. Something heavenly just happened in the world of baking. The butterfinger stuffed cookies are simply dough wrapped around the whole bar, they make large cookies indeed, but who’s complaining? 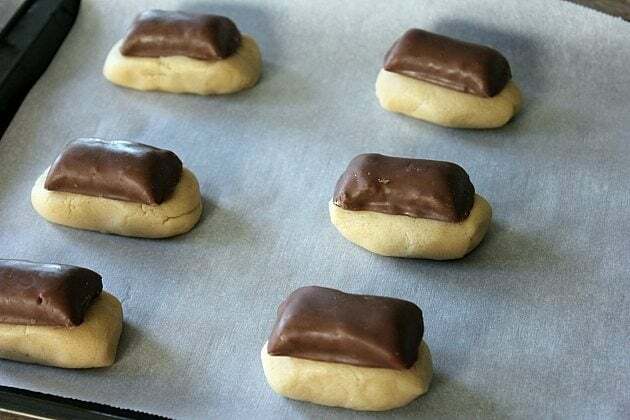 Bake all the wrapped cookies at 350 degrees until they are golden brown and let them sit until the chocolate has hardened again on the top (Butterfinger Bricks). Have FUN with this, let your imagination soar! Take this cookie dough and bake it around anything your little heart desires! These would be fantastic for children’s birthday parties, can you imagine the look on their faces when they see chocolate bars baked into cookies? That’s IF the adult let them have a chance! 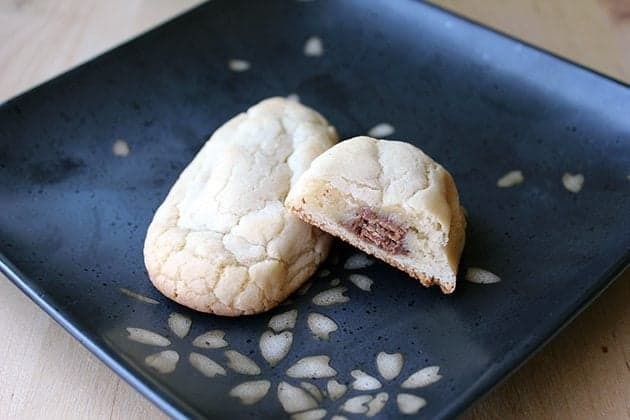 How to make decadent but easy Chocolate Bar Stuffed Chocolate Chip Cookies! Kick the tires and light the fires to 350 degrees.Cream together your butter and sugar until it’s light and fluffy. Add in the eggs and vanilla, mixing thoroughly. 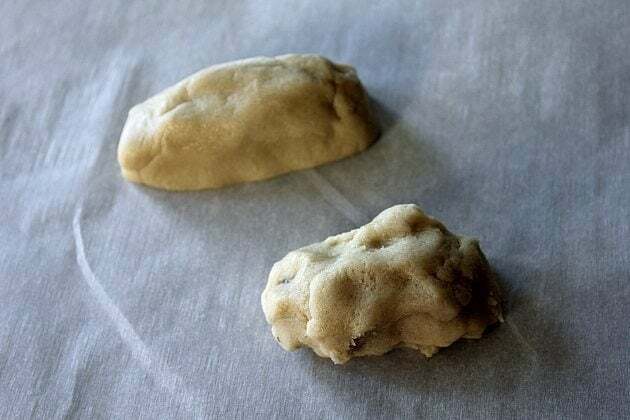 Beat in the flour, baking soda and salt.When that is done, fold in the two cups of chocolate chips by hand, and prepare to wrap chocolate bars! The mini KitKat cookies turned out lovely, little long bars, mine is the top and my daughters creation the bottom. They both baked up perfectly.Take the dough and wrap it around the KitKat like shown in the photos. Wow its great.I love chocolate cookies. Try Andes Mints next! I have a shortbread recipe I add/stuff them into and they have become a Christmas favorite!